Nothing screams comfort food quite like creamy grits and gravy in this prosciutto recipe. Why not amp up the classic Southern dish with some pan-fried prosciutto di Parma? 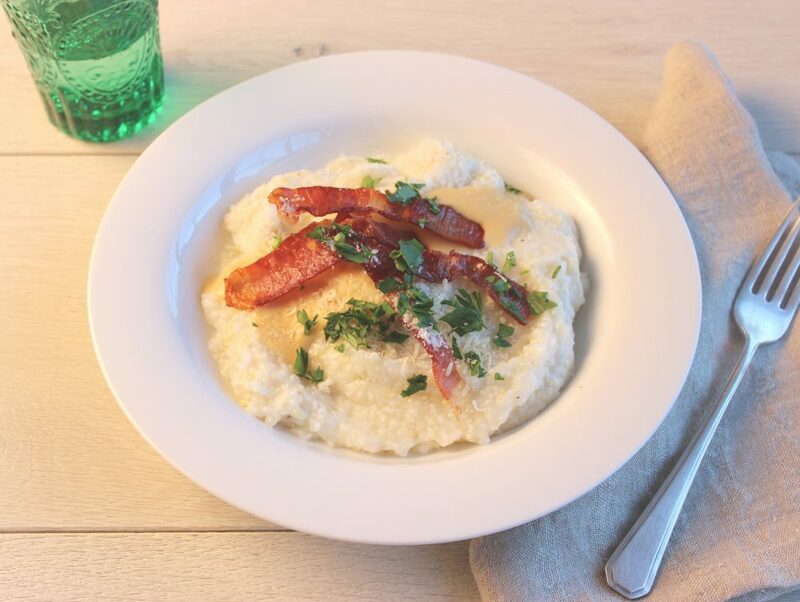 The crispy prosciutto and smooth grits make for a delicious pair, with texture and rich flavor in every bite. Serve this as a comforting dinner or add this to your repertoire of prosciutto breakfast recipes. You can’t go wrong with this winning prosciutto recipe! In a large pot, bring 4 cups water to boil with a pinch of salt and the butter. Reduce to a simmer and add the grits, whisking constantly. Cook, stirring frequently, for 20 to 40 minutes, adding two tablespoons of water at a time, if the grits become so thick that they are hard to stir. The grits will be done when they are creamy and have lost their “crunch.” Keep warm on very low heat. Cut the prosciutto slices into 1-inch wide strips. In a heavy cast-iron skillet, heat the olive oil and fry the prosciutto slices on one side until browned and crisp. Transfer the prosciutto to a paper towel-lined plate and set aside. Remove all but 1/4 cup of the fat and return the skillet to the heat. Add the flour to the pan and cook over low heat, stirring constantly, until it has browned in the residual fat and smells toasty, about 5 minutes. Stir in the sherry and let cook until the liquid has been absorbed. Add the stock and whisk until the mixture is smooth and thick. Add the cream and cook, stirring until the sauce has reduced down to 1 cup. Stir in the black pepper. To serve, ladle the grits into bowls and top with a few spoonfuls of the gravy. Finish with a few strips of crispy prosciutto. Dust with Parmigiano-Reggiano and parsley. Serve immediately.